Bristol-based duo Meadowlark are on tour to promote their second offering of alt-pop. Singer/guitarist Kate McGill and producer/guitarist Daniel Broadley play at Nottingham’s Rescue Rooms on Tuesday, April 26. Their second EP, Dual, was produced by Ant West, whose previous credits include Lewis Watson, LAYLA and We The Wild, and released through Believe Recordings. 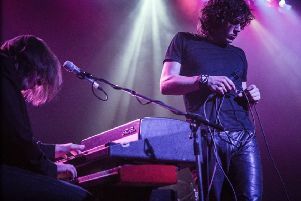 Lead track, Eyes Wide, was premiered on Huw Stephens’ Radio 1 show where the presented hailed the track as one he loves. Earlier this year, the duo supported acoustic troubadour James Veck-Gilodi on tour.